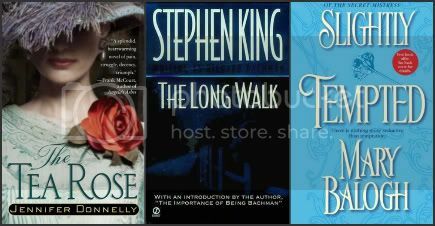 Top Ten Tuesday is hosted at Broke & Bookish, and this week’s topic is reads we think would be great for book clubs. 1. The Complete Maus by Art Spiegelman. I read this for a graphic novels class and absolutely loved the discussions we had about it! It is such a great book to encourage discussion about the Holocaust. I love getting the son of a survivor’s POV and seeing the father through his eyes. 2. 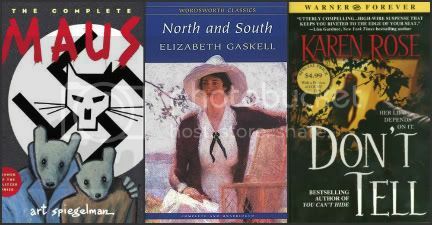 North & South by Elizabeth Gaskell. This is one of my all time favorite classics, and it would make such an awesome group read. People read Pride & Prejudice together all the time – I think this book has a lot more worth talking about. Class consciousness, cotton mills, unions…plus an awesome love story. 3. Don’t Tell by Karen Rose. This romantic suspense novel has some of the best characterization I’ve ever seen. The story of a woman doing whatever it takes to protect herself and her son – going inside the mind of a terribly chilling psychopath. There is so much to talk about. 4. The Tea Rose by Jennifer Donnelly. We follow the characters of this book from England to America. From poverty to wealth. From happiness to struggle. All written by one of the best. I’d love being able to discuss this book with people! 5. The Long Walk by Stephen King. This is an incredibly bleak story, but it has an unbelievably large amount of meaning. Dissecting it with fellow readers would be amazing. 7. The Name of the Wind by Patrick Rothfuss. Um, have you met me? Of course I’d want to read this with a group! Not only would I 1) get to talk all I wanted about one of my favorite books, but it’s 2) a way to get even more people to read it without resorting to blackmail. 8. Ride the Wind by Lucia St. Clair Robson. This one is based on the true story of the kidnapping of Cynthia Ann Parker, who went on to live with the Comanche Indians for over twenty years. Fascinating, no? 9. Rilla of Ingleside by L.M. Montgomery. I picked this one because I’m always wishing I had more people to talk about with. It is the last book of the Anne of Green Gables series, and it is an incredible WWI read (and stands alone just fine). 10. Jellicoe Road by Melina Marchetta. Because it has one of the most intricate and fascinating plots ever. How fun would it be to read this with a group? North & South!! I’m currently reading it and LOVE it. It’s another one that I’m trying to not rush through, so that I can savor the beauty of it. Also loved Rilla. It was one of my favorite Anne books. Ems recently posted..A book signing with Cynthia Hand & Carrie! Jellicoe Road is a great pick! I almost put it on my list. I still haven’t gotten around to Jellicoe Road. Too many good books out there. I need to commit to more rereads. I always enjoy books more when I reread and slow down. Here is my Top Ten Books I Think Would Make Great Book Club Picks. I hope you will stop by! Ooh, there are quite a few books on your list I want to read – like Jellicoe Road and Name of the Wind. You have a lot here that I have not read. Thanks for your suggestions. I haven’t read any of these! But I really want to read Jellicoe Road! I’ve heard great things about it! Great list this week!